Like a chapter in a good textbook, a lecture is an efficient way to deliver course content. However, delivering course content is not always the same thing as fostering actual learning. Studies have shown that during a typical lecture, student attention begins to diminish after the first ten minutes. Additionally, students usually capture in their lecture notes only a small portion of the content that an instructor conveys verbally, and – as Harvard’s Eric Mazur has pointed out – they remember even less of it. One alternative to lectures – or at least a complement to them – is experiential learning. To some extent, experiential learning is self-explanatory: it’s learning that is based on students being directly involved in a learning experience rather than their being recipients of ready-made content in the form of lectures. Educators know that a student learns more quickly and retains more information when the subject matter pertains to them personally. The act of doing makes learning extremely personal. As Sir Richard Branson says, “You don’t learn to walk by following rules. You learn by doing, and by falling over”. 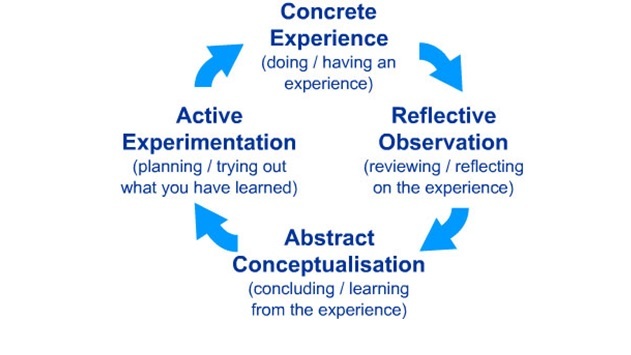 The process of experiential learning involves both self-initiative and self-assessment, as well as hands-on activity.